Designed for Tradesmen, this bevel edged wood chisel has a ground finished, hardened and tempered alloy steel blade, with a one piece, solid impact resistant blue polypropylene plastic handle. The blade is lacquered for rust prevention. 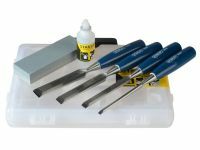 4 x 5002 Wood chisels 6mm (1/4 in), 12mm (1/2 in), 18mm (3/4 in) and 25mm (1 in).